Just arrived & have not used it yet. Seems Saturday and has a good spring mechanism. 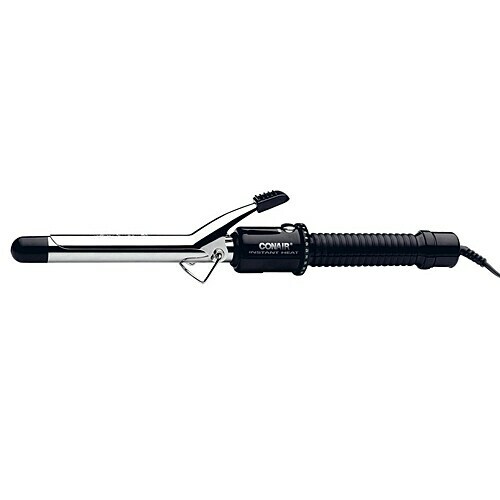 Conair's CD81 3/4-inch curling iron is ideal for creating those tight-to-medium curls that are so difficult to maintain. This iron features dual voltage settings to allow you to take it anywhere with you in the world. The iron lets you select either standard North American 125-volt or 250-volt foreign electricity operation. Conair's sure-grip handle has a patented design for greater control and precision, and the electronic on/off touch pad is easy to use. If you forget to turn off the curler it will automatically shut itself off. With a 60-second heat-up time and a flashing indicator light, you'll have bouncing curls to impress within minutes. Brand new in bag, no retail packaging. I've had this same curling iron for years and love it. It just started to fall apart a little so I searched Overstock and found the exact Conair curling iron. I have no need for anything expensive because this product curls my hair perfectly. This curling iron has many individual heat settings. It hold the tempurature well. And it curls like a professional iron. Conair curling irons have really come a long way!! Love fact that you can change the heat settings!! Just as good as my old Hot Tools iron and so much CHEAPER!! This curler comes with a sleeve to be placed on the curlers after it's unplugged and cooling down, which I think is a very nice feature. It heats evenly and has several settings. I am very happy with my purchase - the price was great too! The varied heat settings, strong clamp and its light weight make this a great curling iron for me. I would definitely purchase this again! Easy to use, light weight, nice heat controls. Fast and easy to use. Heats up quickly, and handles easily. Perfect first Curling Iron for my daughter. It gets to a safe temp for first time users. I have used it twice. It heats up quickly and styles my hair in a manner that I like and is easy to handle. I bought this to give as a gift. I was a little disappointed that it didn't arrive in packaging, it was just loose in a plastic bag but it is a quality product. I just needed to come up with some clever gift wrapping. Works well. Holds heat .yes I would recommend it. Good purchase. My wife wanted this for Christmas and it was the cheapest one. I have the same Conair hot curing iron in a different barrel size and want to be able to have the same great curls in different sizes.